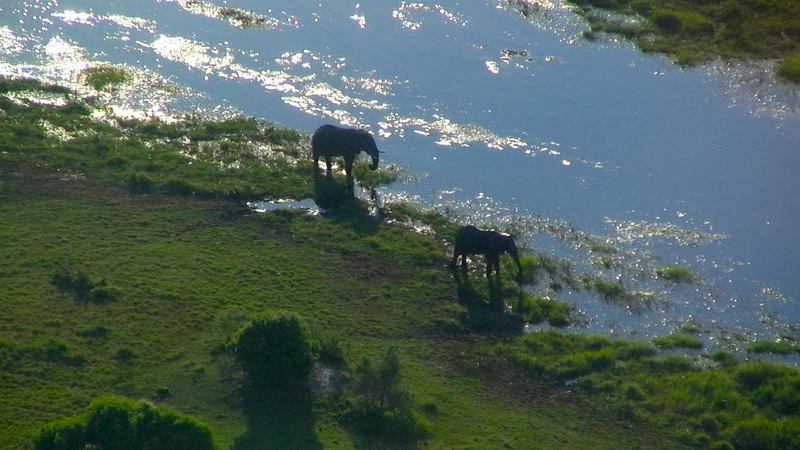 After spending three days in the natural wonder that is Botswana’s Okavango Delta, we had the chance to take a scenic flight over the delta for a unique view of the landscape impossible to imagine from ground level. We were all excited about getting a ‘bird’s eye view’ of things to help us get some perspective on how big the area actually is. 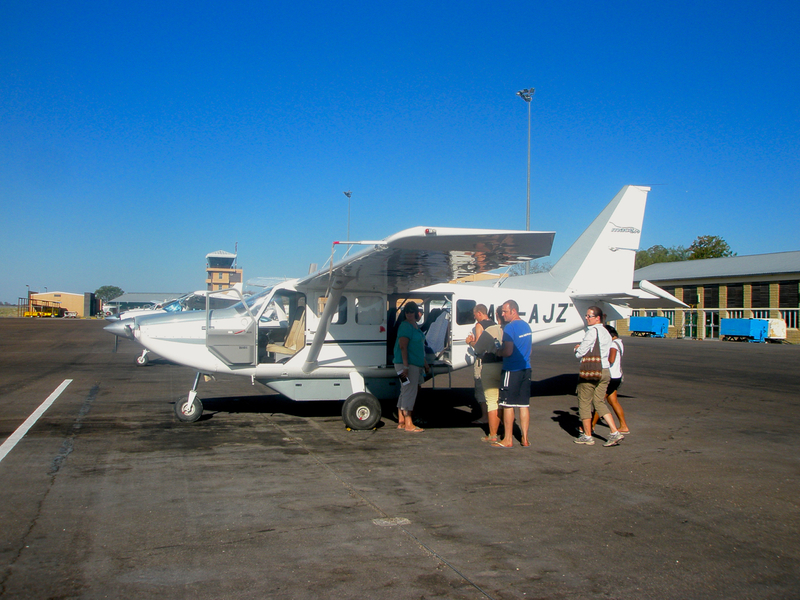 We headed out to the local airstrip, and after switching planes due to some sort of mechanical failure (Always reassuring…), we were speeding down the runway and climbing skyward, all 7 of us packed into the tiny propeller plane. 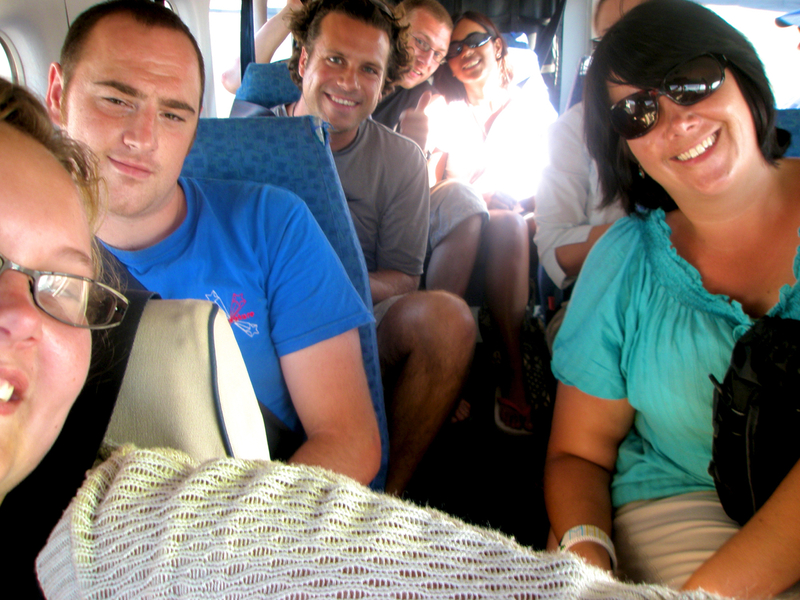 Our pilot had introduced himself with a heavy Namibian accent, and had given us a brief run-through on the path he was going to take while flying over the delta. It was only supposed to be a 30 minute flight, so we would still only get to see a small portion of the delta, but he said we would be flying over the island where we had camped the previous 2 nights, and that we should be able to see the loading area where we had originally set out into the delta in the makoro canoes. Once in the air, we were flying over the dry and dusty farmland that sits around the borders of the delta, irrigation ditches easily made out from our low altitude. Before long, we were over the delta itself, and it became instantly clear as to why we hadn’t had much luck as far as wildlife viewing was concerned- it was HUGE. It spread out before us as far as the eye could see- large and small islands surrounded by a seemingly unending marshland, large lakes and smaller ponds spotted here and there throughout. It reminded me of what it must be like to look at the earth from space- all that blue water, with a few masses of green, brown, and yellow dispersed throughout. Wide rivers made their way through the delta, with smaller streams and waterways splitting off like little capillaries, spreading the flood waters throughout. 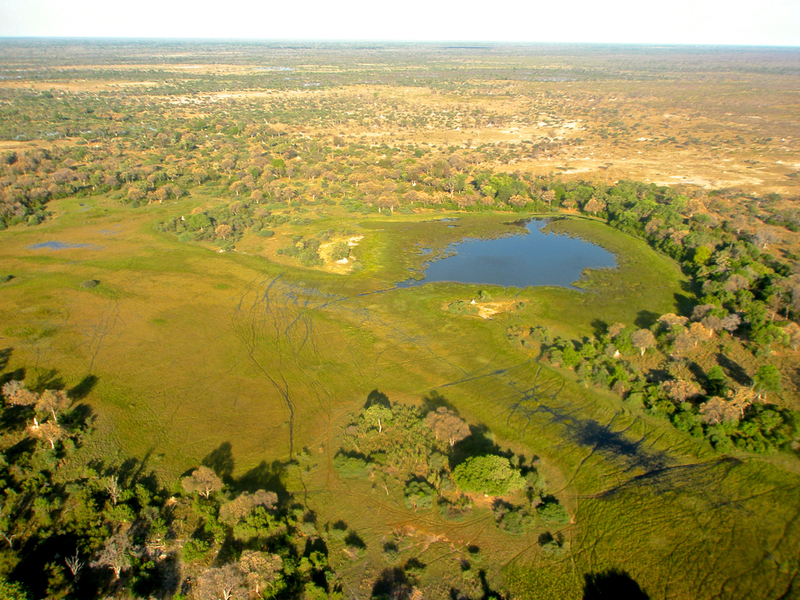 We could pick out game trails meandering through the grasslands and the shallow waterways- herds of elephant or buffalo having trampled the ground and grasses as they moved through the delta. It was incredible- an amazing perspective on this lush oasis in the middle of the Kalahari Desert. As we flew along, our pilot suddenly pointed out the window towards the ground, shouting back into the cabin, trying to be heard over the drone of the engine. “BUFFALO!” he shouted, and we all strained our necks to the windows, trying to pick out what he was pointing at. We couldn’t have been more than 3 or 4 thousand feet off the ground, and looking out the window, were able to make out the black dots set against the green background- a HUGE herd of water buffalo, grazing and resting in a meadow beside a large lake. There must have been hundreds of them… A few seconds later- “ELEPHANT!”, as the pilot banked the plane to circle around a family of 20-30 elephants making their way across one of the innumerable islands. Again, incredible. We slowly realized that all these black spots clustered together on the ground were actually animals, and they were EVERYWHERE. On one hand, it made me wonder at how we DIDN’T come across more wildlife while on our walks in the delta, but also made me realize just how expansive the area was, and, as it always is with wildlife, it was just a matter of being in the right place at the right time. As we continued our flight, we saw many more buffalo and elephants- the easiest to pick out due to their individual size as well as the fact that they tend to travel in herds. We also saw a few giraffe, and some smaller antelope as well. I continued to marvel at the amount of water- unbelievable for being in the middle of a desert… Eventually, we made the turn home and headed back to the airport, cameras full of images taken during the flight. 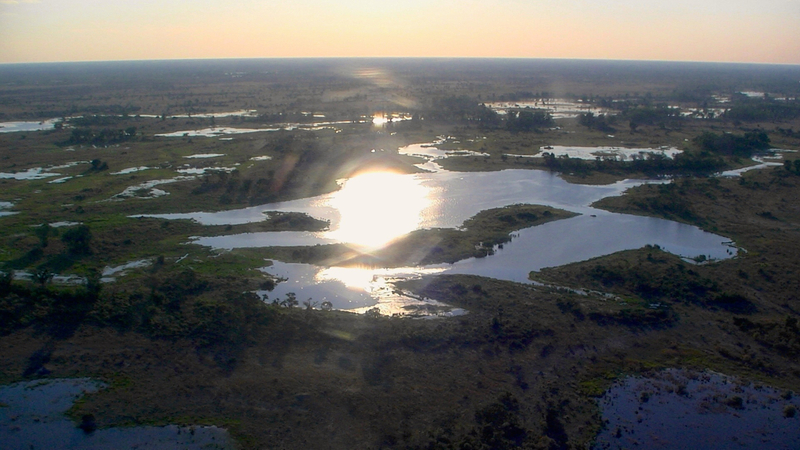 It was an incredible experience, and provided a great perspective on the wonder that is the Okavango Delta.